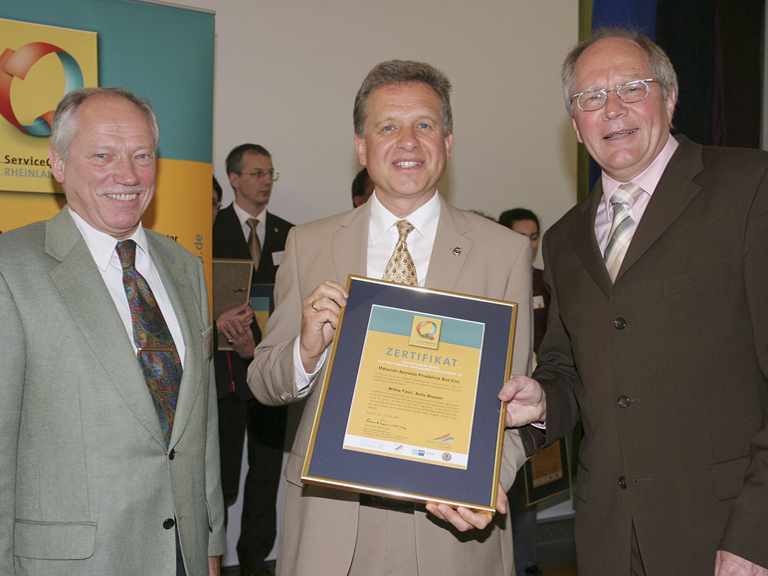 As part of the event “Qualitätstag Rheinland-Pfalz“ (Quality Day Rhineland-Palatinate) in Rockenhausen on April 27, 2006, the state recognized [the Maharishi Ayurveda] Health Centre as the first clinic in Rhineland-Palatinate to be granted an award for business excellence in service performance. With that it became, along with 175 tourism service providers in Rhineland-Palatinate, one of the businesses that continuously practices its own quality control and improvement in performance. Walter Strutz, State Secretary of Rhineland-Palatinate in the Ministry of Economy, Transportation, Agriculture and Viniculture, presented the award to Lothar Pirc, CEO and certified Quality-Coach of the Centre in Bad Ems. The award is given by the training and certification initiative “ServiceQualität Rheinland-Pfalz“ (Service Quality Rhineland-Palatinate), which is a joint project of the IHK (Chamber of Industry and Commerce) and several tourism associations. The Rhineland-Palatinate government-funded initiative continuously analyzes tourism service providers from the guest’s perspective. The Maharishi Ayurveda Health Centre in Bad Ems offers in- and out-residence cleansing programs as prescribed by Maharishi Ayurveda, which benefit health, rejuvenation, and revitalization, as well as a comprehensive service and support program. Twenty thousand guests have benefited from the programs.